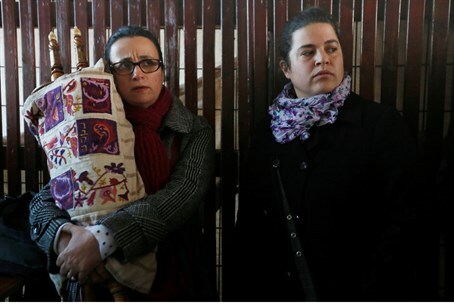 Controversial women’s prayer group allowed in to Kotel, but Torah scroll must remain outside. The controversial women’s prayer group Women of the Wall held its monthly Rosh Hodesh prayers at the Kotel (Western Wall) on Thursday in honor of the first day of the new Hebrew month. The group brought roughly 200 worshipers - an unusually large number given the group's usual attendance of several dozen at best. While the group was allowed in to pray, the Torah scroll they had planned to use in their service was not allowed in. The group’s insistence on holding public Torah readings led by women is part of what has led to conflict over its activities. Religious leaders at the site have argued that the public Torah readings, which are not customary in the women’s prayer section, are distracting to other worshipers. According to Jewish tradition, women are exempt from the command to hold group prayers. The women’s section of the Kotel has traditionally been a place for individual prayer, while prayers with a quorum of ten men are held in the men’s section. While Women of the Wall is pushing to change that tradition, many women have spoken out in favor of the status quo, and have publicly supported religious and political leaders in preserving “undisturbed traditional prayer” at the holy site. More controversially, whilst most of their activities "merely" challenge traditional practices and customs, critics point out that their insistence on conducting services with a Torah scroll - including the Blessings over the Torah - directly contravene Jewish law (Halakha), and are therefore objectively inappropriate for the Kotel. According to Jewish law, such blessings can only be made by someone fulfilling a Torah obligation; since women are exempt from the obligation of reading from the Torah, reciting the relevant blessings is strictly forbidden. Women of the Wall activists expressed frustration Thursday over the decision to prohibit their planned Torah reading. “We’re stuck. One the one hand, according to Judge Moshe Sobol, we’re legally allowed to pray with a Torah scroll. On the other hand, the Kotel Rabbi, Rabbi Shmuel Rabinovich, prevents us from bringing our Torah scroll in,” charged director Leslie Sachs. Rabbi Rabinovich also does not allow the group to use Torah scrolls from the men’s prayer section “which are meant for all worshipers,” she added. Rabbi Rabinovich is openly critical of the group, which he has accused of deliberately provoking conflict and ignoring others’ sensitivities. Government officials have stepped in to mediate the controversy over Women of the Wall, and are working to create an alternate prayer space where the group can hold its non-traditional prayers without causing a disruption. The group has already rejected an earlier attempt at a compromise which saw the government building an alternative prayer site dubbed "Ezrat Yisrael". Members of the organization say that until their demands are met, they plan to continue using the women’s prayer section of the Kotel – and will keep trying to bring in a Torah scroll, as well.